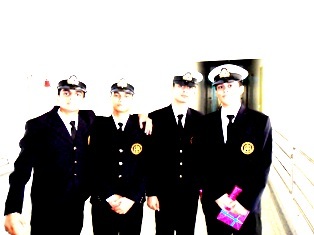 My life at pre sea training institute (Second semester). Over the next six months, institute initiated me into the first operations part of a deck officer, after returning from my home back to the institute for the next semester of the training, it were the STCW courses that had to be done first and to my surprise it was all quite good. We were introduced to different life saving apparatus, personal survival techniques, and social responsibility of seafarer’s part, Medical first aid and Fire fighting which proved to be most interesting one as we got to see lot of videos on fire fighting, the institute had lot of videos and other computer learning material along with plenty of practical exercises with real equipments. 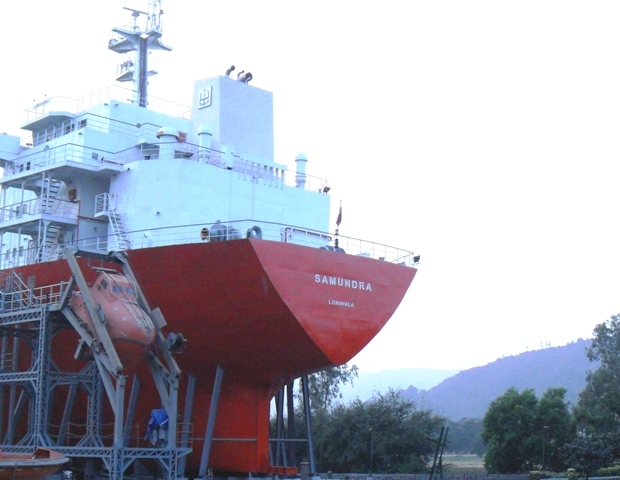 TS Samundra, the training ship at my Institute, SIMS. I had experienced nearly everything that the institute could offer and yet I continued my learning with the next semester’s beginning. ‘By taking risks, I wished to learn, by risking failure a sense of disillusion could come’. I thought everything would be like old wine in the new bottle, but I got proved wrong when the classes began, everything was nearly new. As we got to learn new subjects, now navigation was nearly changed since now it involved the celestial navigation, cargo work no more just involved the general cargo ships, now it was the turn of Hi tech Tankers and container ships. Basic Marine Engineering was also a part of our subject and really it worked well with me, I tried to understand the basic working of each machinery in the engine room along with this text we also had our practices in diesel classes. Seamanship became advanced and now it was no more just a play with ropes, it involved mooring, splicing of wire ropes, shackles and rigging bits, pilot ladder. Maritime law got extended to the sound signals and Morse code and other international communication involved, with GMDSS, flashing with Morse code still is out of my mind, I need to learn it before my second mate’s. 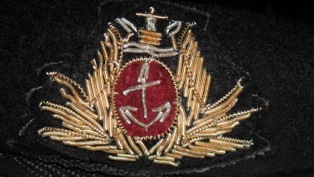 Cap Badge of my Beret. 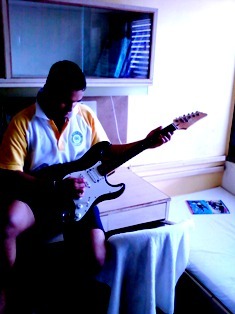 Although am trying to play with that guitar, I don’t know really how to play it! Schedule at the hostel was same, getting dinner at 1900 hrs after the fall in at 1845 hrs in black trousers and waistband, with the white shirts, at 2000 hrs dinner time was over and the warden kept an special eye on the cadets, that no one comes out of his cabin after 2100 hrs, except the cadets on night duties which used to start on 2200 hrs.I was completely soaked with the familiarity of this schedule and now it was no more a problem to manage anything and everything. Sometimes we used to sit till late nights, many of the friends were guitar players and it was good to see them playing, though I could never learn playing a guitar during the pre sea. Some guys used to have electric kettles and Maggie noodles were cooked secretly, although everyone did come to know by the smell! 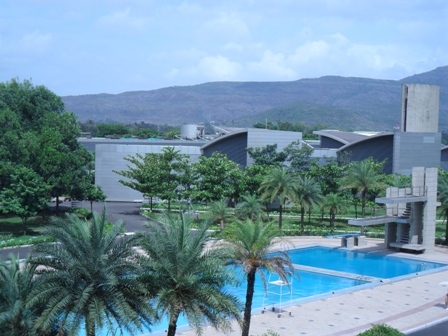 Swimming proved good for me, a dip in the pool after classes was great in the summers. 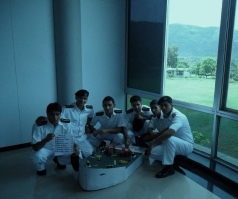 This was the time we were to make a maritime related project, soon we started to work hard on this piece of work, I with my 7 batch mates was the leader of my batch, and we were working on a safe mooring project. It was really hard to get everyone to a point, each had his own abilities and to use each guys talent in a better manner is always a challenge in a group where conflicts keep arising. 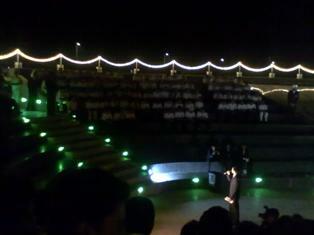 Finally after all of it, we succeeded in our job and it was finally done. Exams were close, everyone got attached to his dear books, exams were not a headache for me this time since now I didn’t have that boring PCM, and everything was suitable, last semester results also proved me good at professional subjects, after all we had visited ship-in campus much more frequently now. Swimming pool at my campus, it was really good to dip in this pool after the classes. 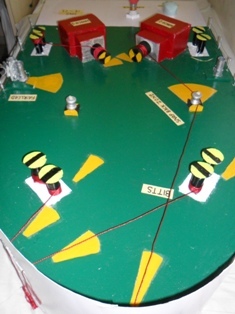 Safe mooring system,with an alarm and demonstration of snap back zones. Me and my batch mates,with our project, two guys missing. Just after the exams were finished, we were going to have our passing out parade, all were excited for this to happen and leave for their home! And it just happened as everything had happened, it wasn’t much grand, nor too bad, Principal Officer from MMD (Mercantile Marine Department), Mumbai was the chief guest, indeed he was pleased as I could make out from his face. Our Dean rocked at the function with motivational speeches and finally the Pre Sea was over. We were to see back for our OTFC and CTFC (Tanker familiarization) next month, and we will see back after our 3 semester’s onboard training. All went good and what remains with you are the memories that you keep close to heart and mind. On the passing out day. 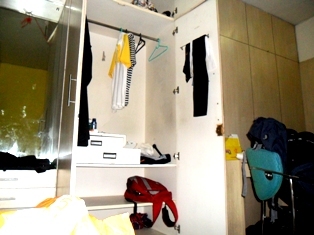 Cleaning the cabin and packing the bags, time to go! This was really the golden period, now I have do head for my onboard training on the high oceans and foreign lands. 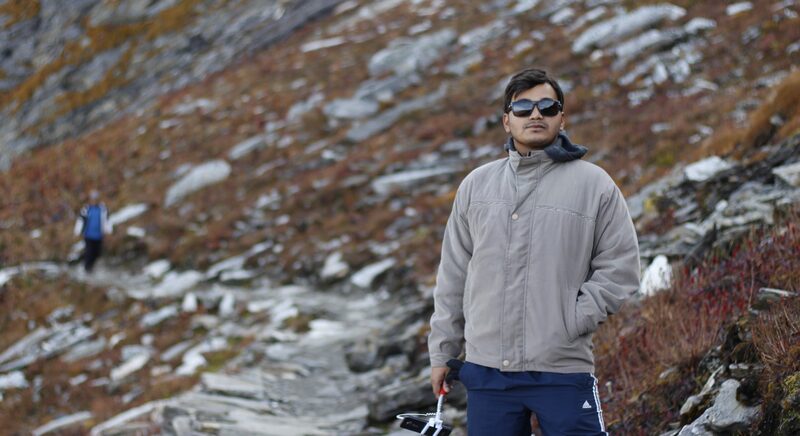 Previous My life at pre sea training institute ( First semester). Next What items to take to the sea, joining ship first time? Are phones allowed in the SIMS campus? Is SIMS a good institue for merchant navy? Talking of cell phones, you can use them in hostels but not roam With them in the campus. If seen by warden, it will be penalised.